How to Get To Tamarindo Costa Rica Once upon a time, Tamarindo Beach used to be a calm and quiet fishing village. Now, it is one of the hottest and most developed traveling destinations in Costa Rica. Getting to this beach isn’t as arduous as it used to be earlier. This place is at the central west coast of the Nicoya Peninsula. Tamarindo doesn’t judge you by the amount of money you’re carrying in their pockets. It gives every traveler of any budget a chance to explore the incredible biodiversity and unspoiled beaches. You can choose to stay at any of the accommodation facilities available at Tamarindo. 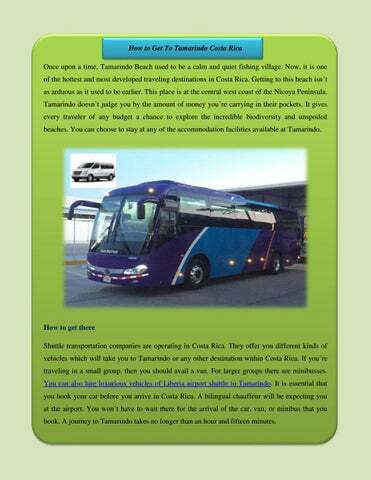 How to get there Shuttle transportation companies are operating in Costa Rica. They offer you different kinds of vehicles which will take you to Tamarindo or any other destination within Costa Rica. 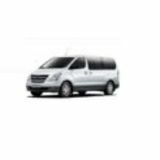 If you’re traveling in a small group, then you should avail a van. For larger groups there are minibusses. You can also hire luxurious vehicles of Liberia airport shuttle to Tamarindo. It is essential that you book your car before you arrive in Costa Rica. A bilingual chauffeur will be expecting you at the airport. You won’t have to wait there for the arrival of the car, van, or minibus that you book. A journey to Tamarindo takes no longer than an hour and fifteen minutes. About Tamarindo You heard about Tamarindo from your friends or saw pictures of the beach on the web. You booked a Liberia airport shuttle to Tamarindo and reached the spot. However, you’re unsure about the things to do at this destination. You should learn a little bit about the location before anything else. It is a quaint town that arose on the northwestern portion of Costa Rica, known as the Guanacaste region. The place was barren, and the scorching heat was a killer until the beach drew all the attention. The usual population of Tamarindo is about five hundred, but in peak seasons, the number can increase to five thousand. Get on a surfboard Yes, Tamarindo Beach is well-renowned for its surfing conditions. Surfing is one of the best ways to experience the peak tourist season of Tamarindo. The sea-waves in this place are world famous, and you can’t afford to miss the opportunity to surf here. If you’re new to surfing, then it isn’t an issue at all. There are surfing instructors here who teach the rookies to surf. The professional instructors know what they’re doing. They won’t let you in the sea before giving you some tips on safety precautions. With their support, you will be conquering the waves sooner than you think. The lifeline Tamarindo is the home of many people who left their jobs and countries to stay here. Tamarindo is one of the reasons why travelers flock in Costa Rica. It is the central hub of shops and activities. You can choose to visit this destination during the dry season from December to April. It is also the time when tourists start filling up the pristine beaches of Tamarindo. You should remember that the weather can be hot during these months. So, you need to keep yourself hydrated at all times. It is also in those months when this destination transforms and becomes a party spot. Your main issue was with transportation from the airport to Tamarindo. With the presence of shuttle transfers, getting there will be a piece of cake.